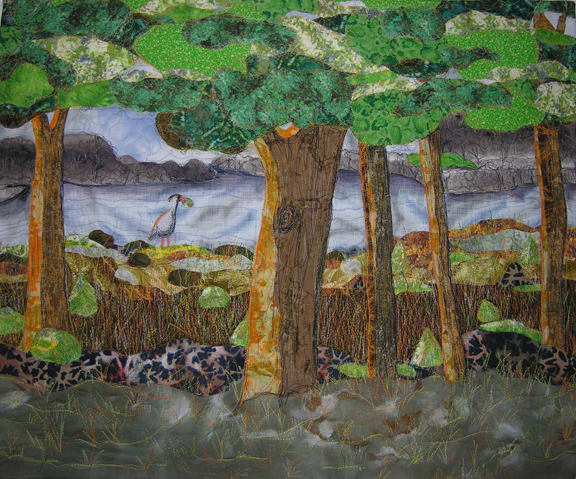 I’ve shared with my readers my journey recreating this landscape art quilt. It was one of my very first pieces completed and was exhibited in a few juried shows and it won Most Original Quilt as well as ribbons in some quilts shows. It was a Noteworthy quilt in 2009 in Machine Quilting Unlimited magazine. I was surprised at the commission request and the mystery of where the original went. I have moved on to more abstract and non-representational work. I wasn’t sure if I was up to the task. But I rarely turn down an opportunity to sell a work! I’m a great procrastinator. Once I wrapped my mind around doing this commission I thought of ways to make a pattern (!!!!) and decided this was going to be easy peasy. So I procrastinated while I worked on things that were fun. This was going to be work. So the first thing I learned is that even with making a basic pattern , no two art quilts will ever be the same. They are the same but different. The middle tree is fatter and the heron is fatter…must have eaten a few more trout over the years. But its mostly the same as the original piece. Because I had good photos of the first piece I was able to blow them up to get a general feel of the quilting. Surprise! Muscle memory took hold and when I was in the zone stitching I felt like this was the first time. In other words, time went in reverse and I had the feeling I was doing this for the very first time; thinking ahead to the next area to stitch. But the very most important thing I learned was that I LIKE to do this kind of work. I was able to get in a zone of work in the studio that I haven’t experienced for a very long time. And it was not work, it was FUN. Here is the completed piece, shipped off to Einstein Health Network, Moss ReHab, today. Copyright Janice Paine Dawes, all rights reserved.